Photo: Our Girls Home residents are very happy about the new campus access road that will make it easier for them to get to and from school. We are thankful to report that our native team on the island of Cebu recently finished paving a new access road which leads to our orphan home and farmland enterprise. The previously flood-prone dirt road was very problematic — when the frequent tropical rainstorms would occur, or any time there were heavy rains, all the gravel of the driveway to the entrance of the campus would wash away and become muddy. It was becoming expensive to spot-repair the road with new loads of gravel. Every time the road got washed out, a large muddy pool at the lowest point of the road would make it difficult for our hen house and fishery customers to access the campus, which affected our sales. It was also making it difficult for our children of the Hope Center after-school care program to access their study hall building. Now with a paved concrete road, we will no longer have these problems and our native team and the children are very happy about this new development. We are also happy to share the redemptive story of a woman in our ‘She Has Hope’ crafts-making program, Mahalia, who is 48 years old with 4 children. Her husband has abandoned them, making it very difficult for her to care for the children. Before she enrolled in our program, she was under great stress because she had no consistent income to provide for her children’s needs. Mahalia could not send her children to school and they often did not have enough to eat. Her home was in such disrepair from storms that she almost had to abandon the property, and she also struggled to buy clothing for herself and her children. However, now Mahalia is very happy because the crafts-making program has made a big difference in her life financially. She has learned to make natural palm tote bags, banana fiber placemats, and various wicker bags and purses which has given her a great sense of accomplishment. She is also able to care for her children while she works from home, allowing her to earn an income of approximately $300 per month from crafts she sells to local businesses. Believe it or not, this is on par with Gross National Income averages in the Philippines. Her home is in better condition now, and she doesn’t have to worry about what she or her children will eat or wear. Mahalia feels very blessed and thankful to be a part of our crafts-making program, enabling her to care for her children and have a better quality of life, full of hope. Our program also ensures that Mahalia and her children are not at greater risk for human trafficking, which is sadly very prevalent in the Philippines. Traffickers prey on those suffering from extreme poverty, as they are more likely to believe their lies of false employment schemes that trap them into slavery. Photo inset: (Top-left): Our fishery is running smoothly with 3,000 healthy fish, adding a protein-rich ingredient to our children’s diets. 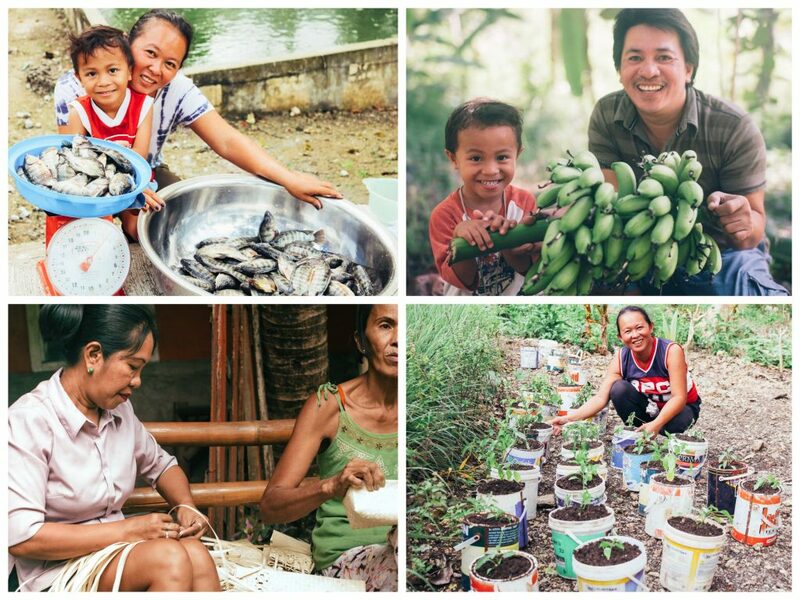 (Top-right): Our banana grove continues to thrive with 85 trees which are harvested weekly. (Bottom-left): Mahalia is thankful to be enrolled in our ‘She Has Hope’ crafts-making program, enabling her to care for her children and have a better quality of life. (Bottom-right): We recently planted chilies, okra, basil, and lemongrass, and we look forward to a bountiful harvest of these crops. Our fishery has completely recovered from a severe storm in January which produced heavy rains and strong winds, causing our fishery to overflow, thus we lost approximately 500 fish. We are thankful that our fishery is running smoothly again with 3,000 healthy fish, and that recent on-demand sales gave us a profit of $210. We recently made a change to our sales plan: instead of doing mass harvests to sell to market vendors, we are now selling smaller harvests on demand to families and smaller vendors. We are grateful for these profits since the funds are used to make improvements at our Children’s Hope Center on our Cebu campus. The supply of fish also adds a protein-rich ingredient to our children’s diets. Our banana grove continues to thrive with 85 trees which are harvested weekly. An average single harvest yields a profit of $6.00 which really adds up as we harvest bananas so often. Our banana grove also provides a nutrient-dense staple to our children’s diets. Our coconut grove is also doing well — we look forward to harvesting our 85 mature coconut trees in May — an average harvest yields $38.00. We have 115 coconut trees total, including 30 new coconut trees which we planted 11 months ago — the new coconut trees will mature in 7-8 years. The younger coconuts are a delicious and refreshing snack for the children. Our goat farm project is another one of the many agricultural projects located on our Cebu campus which provides food for our program recipients and supplements funding for our Cebu programs. We currently have 8 goats, 2 of which are pregnant, because we recently sold 2 goats at market — we received $107 as profit. We currently have 20 mature ducks, but no ducklings at this time. However, soon these mature ducks will breed and thus we hope to have ducklings soon. We also recently planted chilies, okra, basil, and lemongrass, and we look forward to a bountiful harvest of these crops. In other good news, our 12 solar panels have been serving us well since they were installed in October 2015. They help to minimize our electricity consumption, and allow us to save $155 from our monthly electricity bills. And our Children’s Hope Center on the island of Cebu is doing well — 40 children are enrolled in the Hope Center’s after-school care program which includes homework tutoring for math and English, and other activities, along with snack and meal services for children suffering from extreme poverty. With your support we are hoping to buy an air conditioning unit to keep our children and 2 teachers cool in the hot summer months.